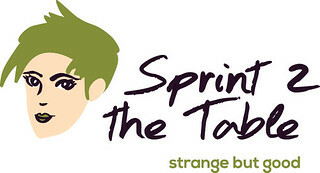 This is my second week of participating in Strange But Good-hosted by Laura at Sprint 2 the Table. I think it’s a fabulous idea and I wish I’d thought of it! MOST of my food is Strange But Good if you ask some of my friends. I thought it might be fun to talk about Christmas dinner, so here goes! We decided instead to recreate the dinner scene from The Christmas Story…dinner at a Chinese restaurant! We think this was our 5th year and it was fun as always. We went to our usual restaurant, Sakana Oriental. It’s nearby which is great. I started out with Hot and Sour Soup. I love this restaurant because they have vegetarian Hot and Sour. It doesn’t really look that appetizing now that I look at it, but it Is delicious! Clears your sinuses too if you need it! For dinner, I used to always have the Chinese eggplant in garlic sauce and I loved it. Last year, I decided I needed to add some protein to the mix. I requested tofu be added to it. Again, it doesn’t look great, but it is Delicious!! Brown rice on the side. This is just my favorite dish. We always say we should go her more often than just Christmas, but we rarely do. I’m not sure if this is a staple on other Chinese restaurant menus. This is the only one where I’ve ever seen it. It is just so good. If you ever see it offered, give it a try! So that is Strange But Good for this week. Even though I just ate, looking at these photos…I’m getting hungry! I really do love it. I should try to replicate it myself!! Just so you all know, I’m feeling strong with my efforts to get back on track with my Weight Watchers efforts. Feeling successful and in control! Happy Friday! Go eat something Strange But Good! This entry was posted in Uncategorized and tagged Holiday Hub Bub, Strange But Good, Weight Watchers. Bookmark the permalink. fran, i think ralph and my dad would get along wonderfully as dad always says there is no such thing as too much turkey. most years, he convinces mom to get 20+ lbs! this year, there were six of us at dinner and dad was disappointed with the *measly* 12 pound bird! i love your sakana oriental tradition. our xmas eve tradition is kfc, so you know i fully agree with going beyond “usual” festive choices! I think they would get along anyway, Cathy, but the turkey would certainly bond them! A local grocery store gives out free turkeys for a certain amount of dollar value purchased during a certain time. I used to get the free turkey at Thanksgiving and keep it in the freezer until January and then cook it…All…For…Ralph! I don’t shop there on a regular basis since finding Aldi. I need to find him a little birdie for himself in the next few weeks! KFC sounds good…locally there’s a KFC/Taco Bell combo…that would work for me! Have a great day! I hope you had a wonderful Christmas, Fran! We had ham for Christmas dinner, but we love having Chinese food on New Year’s Eve. That’s quickly becoming our tradition! Glad you like it, Laura! I’m having the BEST time with the link-up…Thanks for starting it, Sweetie! Sounds like a lovely Christmas dinner! We had KFC for thanksgiving this year. And it was fabulous! I’m thinking both look really good. Of course, I love Chinese food. The spicier the better. What a fun way to celebrate with your family. I’m sure it reduces the stress and lets you focus on each other. Carli, it really is fun! As you say, less stress and we focus on just being together and enjoying ourselves! Besides that, I think it’s Delicious!! Have a great day!